Benninger technique with BriteVu can be used to enhance MRI images. 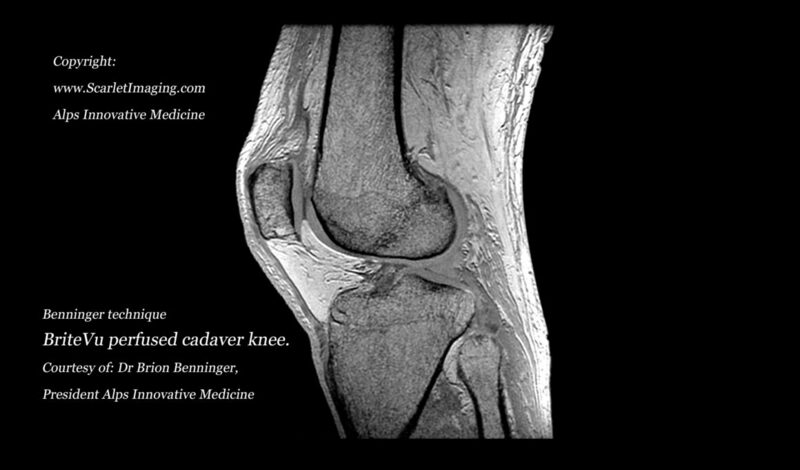 In this video, BriteVu has been perfused through a human cadaver providing contrast in the knee. The cadaver was subsequently MRI scanned. CT images, highlighting the Benninger technique BriteVu perfused vasculature, of the same cadaver are interspersed through the MRI video. The femur (top), patella (left) and tibia/fibula (bottom) are seen as the video goes through the tissue. Because BriteVu is mixed with water, it serves as a positive contrast with some MRI studies. Additionally, gadolinium can be added to the BriteVu mix to improve MRI contrast. BriteVu perfused with Echols technique for animals and Benninger technique for cadavers can be CT and MRI scanned post-perfusion to increase the amount of data collected. BriteVu perfused with Benninger technique cadavers are being used to study normal, aberrant and pathologic anatomy. This cadaver was perfused courtesy of Dr Brion Benninger MD, President, Alps Innovative Medicine (AIM), and scanned by Samaritan Lebanon Community Hospital Radiology services.